Lymphatic filariasis is caused by infections with Wuchereria bancrofti, Brugia malayi or Brugia timori. These nematodes have an indirect life cycle with an insect vector. Lymphatic filariasis caused by W. bancrofti is also called Bancroftian filariasis. Third-stage infective larvae escape between the mouth parts of the mosquito and enter the host via the skin lesion. The larvae migrate through the lymphatics where they mature to thread-like adult worms (4–8 cm in length). After several months, worms mate and females start embryogenesis. They produce thousands of microfilariae, first-stage larvae, which are periodically demonstrable in the peripheral blood. Most lymphatic filarial species have a nocturnal periodicity (microfilariae counts peak between 10 p.m. and 2 a.m.). The pre-patent period (time from infection to the first detection of microfilariae) is 1 year or longer. 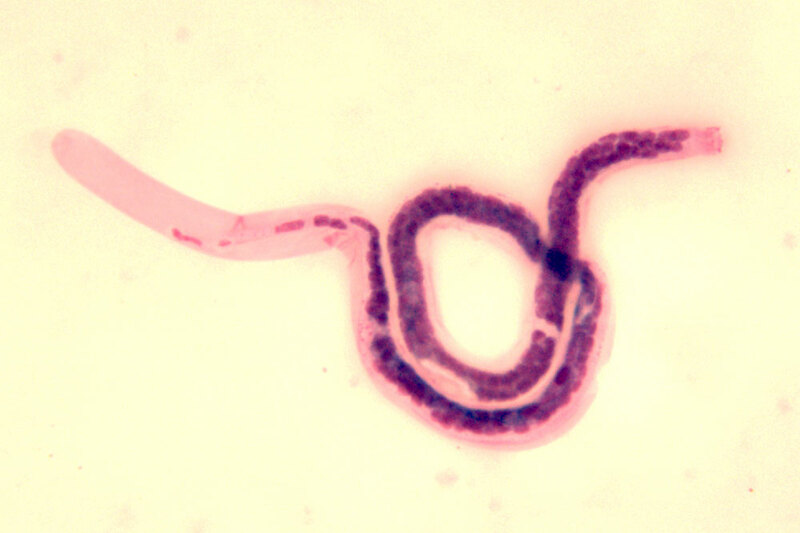 Adult worms are long-lived (10–20 years). Microfilariae are taken up by the vector with a blood meal. They have to escape digestion. The larvae penetrate the insect’s gut wall to enter the thoracic muscles, where they moult twice to produce infective third-stage larvae which migrate to the mosquito's proboscis. In each endemic area, there are local vector species belonging to the genera Culex, Aedes or Anopheles.